If you’re not going up you’re going down. if you’re not going right you’re going left. we were at 12,ooo feet elevation this morning and by evening we are at a few hundred feet. The bikes run fine at elevation, but they don’t like to start easy when their not warmed up, at that elevation. It took quite awhile but they finally started. With fuel injection and computer controlled fuel delivery, altitude is adjusted for when running, one advantage over a carbeurated engine. So the bikes run great at altitude, it’s just the initial start up is tough. 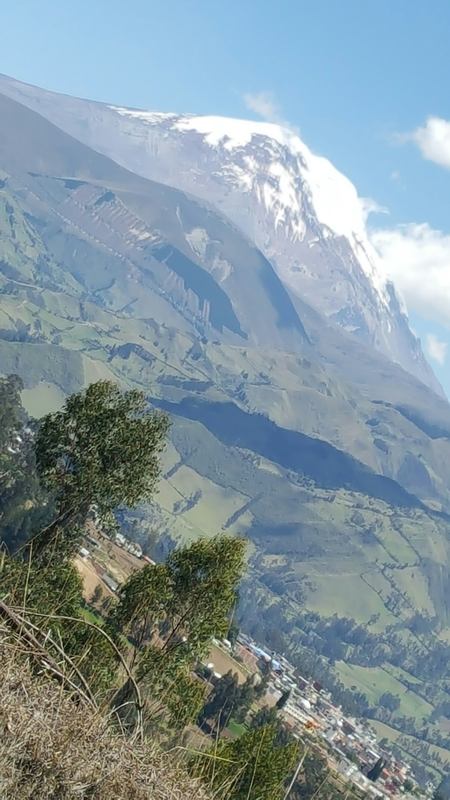 The highest point in ecuador, about 19,000 feet. By mid afternoon we had dropped into the low lands of bananas and some cocoa plants. Most of that on paved road, so we made some distance late in the day.